U.S. President Donald Trump and Indian Prime Minister Narendra Modi at the White House in Washington, D.C., on June 26. The U.S. State Department on Monday designated Syed Salahuddin, the Pakistan-based head of the jihadi group "Hizb ul Mujahideen", as a global terrorist. 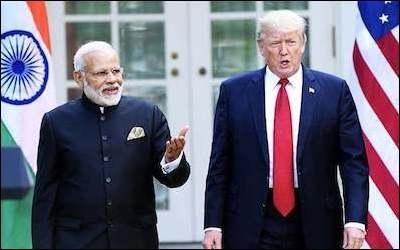 The announcement came hours before U.S. President Donald Trump declared at a joint press conference with visiting Indian Prime Minister Narendra Modi, "We will destroy radical Islamic terrorism." North of the border it was a somewhat different story. Canadian Minister of Citizenship Ahmed Hussen told a Muslim Eid congregation Sunday that henceforth, Canadians with dual nationality who are convicted of terrorism would not be deported to their home country after serving their sentences. As the large crowd cheered, Hussen uttered the well-rehearsed Liberal script that puts a positive spin on an unpopular move that permits continuing Canadian citizenship for convicted terrorists. "There will be no second-class citizenship any more. A Canadian is a Canadian is a Canadian," Hussen declared, also a favourite catch phrase of Prime Minister Justin Trudeau. 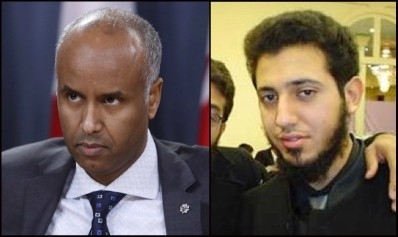 Canadian Minister of Citizenship Ahmed Hussen (left ) believes that Jordanian-born terrorist ringleader Zakaria Amara (right) should be allowed to stay in Canada with full citizenship after he's released from prison. Among those who will benefit from this outrageous appeasement of Islamic terrorism are Jordanian-born Zakaria Amara, ringleader of the Toronto 18 jihadis, who planned an al-Qaida-style terrorist attack in southern Ontario, and his mate, Saudi-born Saad Khalid. So as America and India were jointly moving to combat "radical Islamic terrorism," Canada's leaders were busy playing identity politics. It is almost as if individuals who do not belong to an ethnic, racial or religious group in Canada have no value and thus are taken for granted. Here is a simple question to ask leaders of Islamic groups: Is it true that every time a Muslim stands up to pray, they have to utter a verse that indirectly mocks Christians who have "gone astray from God" or Jews who suffer the "wrath of Allah"? nor of those who are astray [Christians]. The Qur'an was compiled around 650 AD. However, 250 years after the death of Prophet Muhammad, in the late 800s, his sayings (hadiths) were recorded, claiming that when asked to explain the verse, the Prophet himself said the people suffering the "wrath" of Allah were Jews, and the "astray" were Christians. Ever since then, many Muslim children memorize the verse and are told about the reference to Jews and Christians. Muslim leaders must declare their rejection of Islamic scripture mocking Jews and Christians. Muslim leaders of mosques must come clean, and declare that the hadith mocking Jews and Christians should be rejected. So should Hussen and his 10 Muslim MP colleagues. We Muslims cannot have it both ways. We cannot pray five times a day to mock Jews and Christians, then say that we don't. Either we reject the hadith that sanctions such contempt or admit that it is flawed. We cannot cheer the granting of citizenship to our co-religionists convicted of terrorism and yet claim we are committed to the Western values that are the foundation of this country.